These Egyptian antiquities are housed in rooms decorated in 19th-century retro-Egyptian style by Giuseppe De Fabris. Room 2 has some painted mummy cases and sarcophagi along with jewelry and other funerary accoutrements. Room 3 contains the statues from an Egyptian-influenced fountain/temple built by Hadrian at his villa in Tivoli. 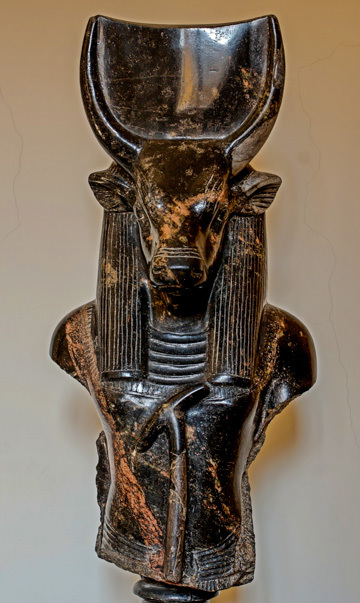 Room 5 has excellent statues of pharaohs, queens, and gods dating back to the 21st century BC. Viale Vaticano (on the north side of the Vatican City walls, between where Via Santamaura and the Via Tunisi staircase hit Viale Vaticano; about a 5–10 minute walk around the walls from St. Peter's). 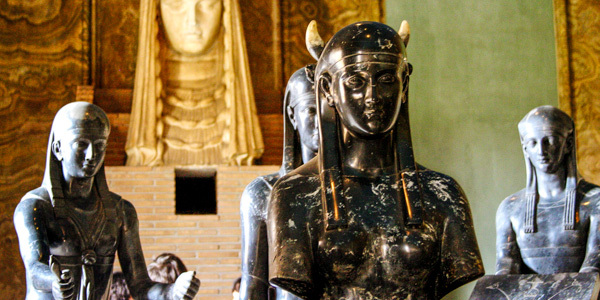 How long does Vatican Gregorian Egyptian Museum take? Planning your day: Expect to shuffle through the Egyptian stuff in 15 minutes—but do spend all day at the Vatican itself. Two days if you can swing it. Even on a tight schedule, expect to pretty much spend one full day seeing the Vatican Museums and St. Peter's together. They're worth it. Warning: The ticket office closes 2 hours before the museum, with the last entry at 4pm. Vatican tours: There are two-hour tours of the museums and Sistine Chapel available (in English usually four time a day) for €32 per person. Three-hour tours that also include St. Peter's cost €37. Note, though, that those prices include the €16 admisison ticket and €4 booking fee, so the tour portion actually only costs an extra €12–€15. For more info: tel. +39-06-6988-3145 or www.vatican.va. 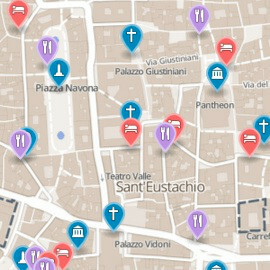 Admission quirks: When the Vatican is free, closed, crowded, open late, etc. The Vatican Museums are free on the last Sunday of each month, when they stay open until 2pm (last entry: 12:30pm). This, however, is no secret, so they are also intensely crowded. On any other Sunday, however, the Vatican Museum are closed—and if that final Sunday of the month happens falls on a church holiday (see below), they also remain closed. The Vatican is also free on Sept. 27 (World Tourism Day).. The Vatican Museums are most crowded on Sundays (because they're free) and many Wednesdays (because in the morning St. Peter's itself is often closed for the papal audience in the piazza, so everyone who doesn't have tickets walks around the walls to kill time inside the museums, and by afternoon all the audience-goers join them). The Vatican has been experimenting with reopening the museums on Friday evenings in spring and early summer then again in fall allowing a limited number of visitors—upon advance booking only—to wander the mooonlit galleries without the crowds. Hours: 7am to 11pm on Fridays (last entry: 9:30pm). The Vatican Museums are closed on all church holidays: Jan. 1, Jan. 6, Feb. 11, Mar. 19, Easter Sunday and Monday, May 1, June 29 (Feast of St. Peter and Paul—major Roman holiday), Aug. 14–15 (everything is closed in Rome on Aug. 15; head to Santa Maria Maggiore for mass with a "snowfall" of rose petals), Nov. 1, Dec. 25 (Merry Christmas! ), and Dec. 26 (Santo Stefano—huge in Italy). Note that the Vatican Museums close surprisingly early (last entry at 4pm, doors close 6pm). So see the Museums first, then walk around the walls to visit St. Peter's. Recently, the Vatican (or at least some guards) seems to have decided that you must dress "appropriately" to visit any part of Vatican City—including the museums—and not just St. Peter's, where a dress code has long applied. Err on the side of caution and make sure you arrive with no bare shoulders, knees or midriffs. That means: no shorts, no miniskirts, no sleeveless shirts or blouses, no tank-tops. Also, no hats. Also, you cannot bring into the museum any bag or backpack larger than 40cm x 35cm x 15cm (roughly 16" x 14" x 6")—there is a cloackroom where you can leave it. Cipro-Musei Vaticani is the closest Metro stop (on the A line, about 5 blocks northwest of the entrance; just follow the crowds). Otherwise, bus 49 stops right in front of the museum entrance (you can catch it from Piazza Cavour, or anywhere along Via Cescenzio, which starts at the northwestern tip of the piazza, near Castel Sant'Angelo). You can also take bus 490, 492, 496, N1 to Via Candia (two blocks north of the entrance), or one of many bus lines to Piazza del Risorgimento, tucked into a inside corner of the Vatican walls a short walk east of the musuems entrance: 23, 32, 81,Tram 19, 271, 492, 590, 982, 990, N11.